Concrete mixtures used in traditional mudjacking are heavy and will also sink overtime. Polyurethane technology is designed to provide a lasting solution. The polyurethane foam will withstand potential damages caused by flooding and weather related factors because of its stability and resistance to water. Polyurethane is durable. The foam mixture is non-absorbent meaning it will not expand, contract or crack under extreme weather conditions or sudden temperature changes. Polyurethane is certified quality material. The polyurethane used by Concrete Experts is certified by HMI and is guaranteed fresh and top-quality product. Polyurethane is sustainable. Concrete levelling vs. replacement means fewer concrete slabs end up in landfills. In addition, HMI polyurethane foam is made from 40% recycled materials. Floors are meant to be flat and even. If you’re experiencing slanted floors or cracked driveways, chances are your house has begun to sink which raises a number of issues. Injection of polyurethane foam into problem areas enhances structural stability, ensuring your house has a firm foundation. Lips into the garage causing water to drain in between the slabs and not down the driveway perpetuating the problem. Negative slope towards the house possibly causing cracking in the foundation and water leakage into the house or garage. Uneven joints that are tripping hazards and can hurt those who visit your home or place of business. Cracks caused by sinking concrete or concrete not sitting on the ground. Ice and pools of water where the water can’t escape due to improper drainage. 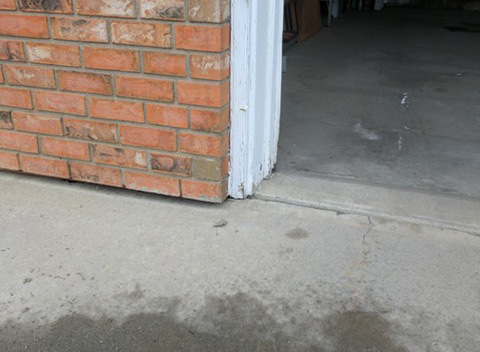 Uneven garage or man doors due to concrete sinking on one side or the other. Nesting areas for voles, skunks, and rabbits that is created by sinking ground or voids under concrete. – If damaged/old will look the same after the lift. We provide both of these solutions and are happy to provide you with a cost comparison. Cracks in your sidewalk and walkway can be dangerous tripping hazards and unaesthetic eye sores. We can raise and level your walkways and eliminate cracks with our unique formula and technique. 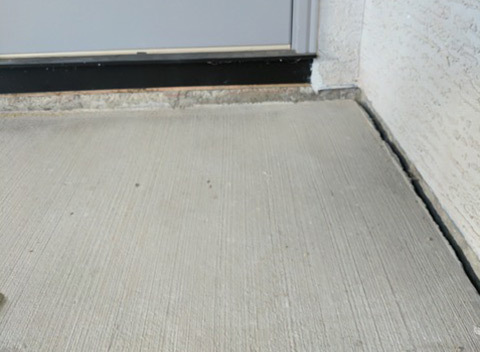 For tougher cases, concrete replacement may be necessary and we can help with that too. Extra-large steps that can be too large for children or elderly and just downright uncomfortable for anyone really. Not enough support for additions or decks sitting on concrete slabs. 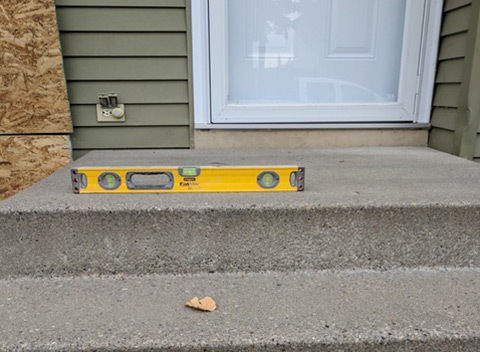 If the steps leading up to your home or business have started to crack or sink, it’s best to catch the problem early on. 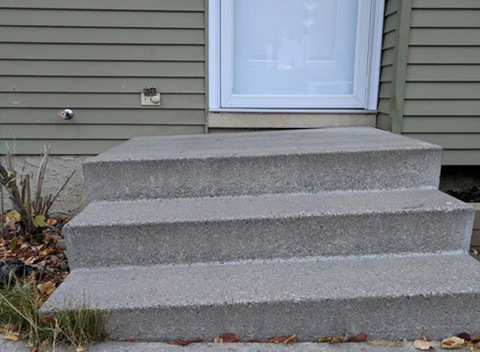 The weight of sinking cement steps can cause additional cracking of sidewalks as well as leave gaping spaces. Sunken steps are also an inconvenient tripping hazard. Consider what lifting, levelling or replacing your concrete stairs could look like for you. Pulling away from the house. Sinking down creating large steps into the home or place of business. Cracking sidewalks because they are dropping with the stairs. Pooling ice or water at the bottom of the stairs. 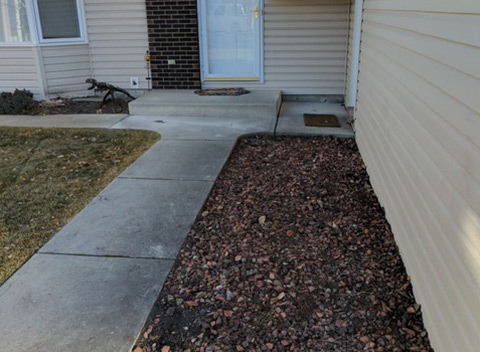 Improper drainage towards the house causing flooding or cracking in the foundation. 2. Mudjacking or lifting the stairs. + Less invasive-work is done in one day. – If stairs/steps damaged/old will look the same after the lift. As buildings sink and shift over time, cracking isn’t the only problem to look out for. 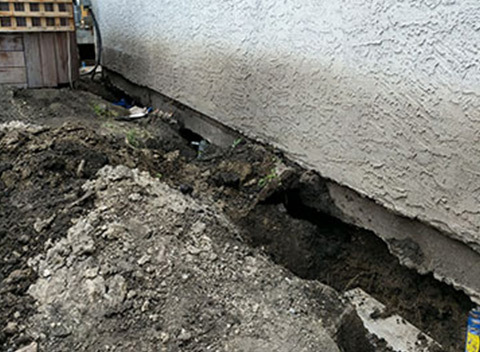 Large holes and voids that form around the foundation can be dangerous. We can inject these holes with polyurethane foam to secure and stabilize your home as well as the foundation upon which it stands. No support under concrete causing the building or floor to sink. When machinery or other equipment goes over the floor there is movement in the floor that can cause problems with the infrastructure or machinery operating on the floor. Nesting by voles, skunks and other critters causing a hazard. 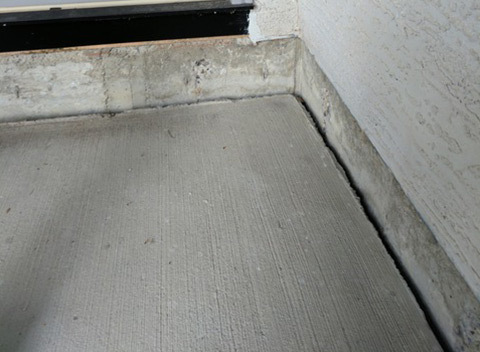 Water tends to accumulate in these areas because of improper drainage and the area is not sealed off causing instability underneath your concrete/building. By using state of the art technology, we inject polyurethane foam into the area. Not only does it fill the void and support the concrete, but it stabilizes the ground and compacts it creating a more stable subgrade. The polyurethane foam can support tens of thousands of pounds and will last forever. Only UV light can break it down. We had Concrete Experts raise a slab of concrete on the side of our house. I was very impressed. Professional, on time, and top quality work. Then they followed up to make sure we were happy with the work. I highly recommend this company. Called for a job and got a quote the same evening, a very competitive quote I might add. The job was done professionally and even cleaned up after which doesn’t happen with a lot of trades. Nice guys to deal with. Wish this was the norm with other businesses. Thanks for making it easy. Bryan and his team were actually at my neighbors place and I asked if there was a time he could come back and take a look and quote on my driveway, he told me now was good. He looked at my driveway and garage pad, quoted me a price, worked a deal with my neighbor and did the work right then and there! Very professional, courteous, and gave me a realistic quote that didn’t change after the work was completed. I highly recommend Bryan and his crew to everyone! 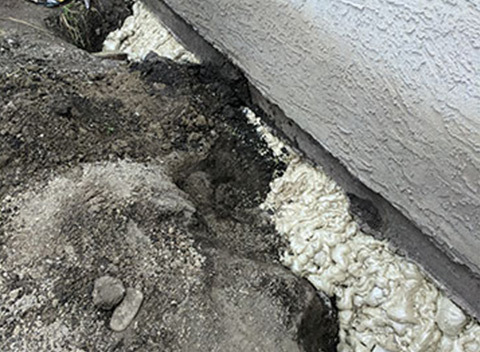 Sunken concrete is a problem that plagues the Calgary market more than most others. Due to the dramatic shifts in temperature between the summer and winter months and the harsh snowfalls that often last all winter, concrete is prone to cracking under the pressure as the ground beneath becomes uneven and unstable. Calgary chinooks bring welcome reprieve from freezing temperatures but the sudden warming can easily cause shifts in the soil and tension on concrete. The benefits of concrete levelling and lifting are a matter of aesthetics as well as safety. Cracks in sidewalks and the walkways in front of homes and businesses can become obvious eye sores. We employ a technique that involves the injection of polyurethane foam into the problem areas. The process is much faster than replacing the concrete slabs and much cleaner and more efficient than using a method of traditional mudjacking to lift and level the concrete. 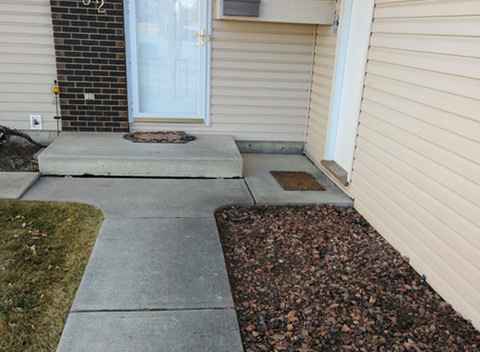 Concrete levelling eliminates the unappealing cracks and crevices in your sidewalk and improves your curb appeal. Even more worrisome than ugly gaps and cracks are the potential tripping hazards and especially the water damage that can stem from the effects of sunken concrete and shifting soil. 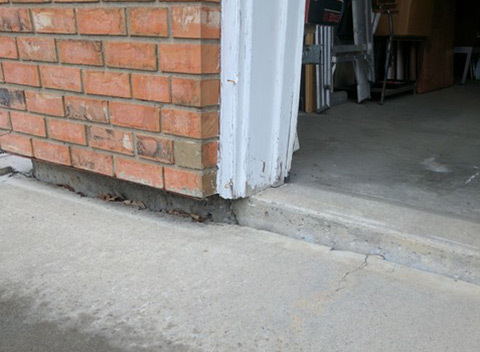 Cracked and uneven driveways can affect water drainage and result in basement flooding and leaks in building foundations. In such instances, the effects can be long term and degenerative over time. The concrete levelling and lifting services we provide will serve as a lasting solution to these issues. The polyurethane foam we use is less porous and more durable than mudjacking mixtures. The compound of cement and mud used in traditional methods weighs 50 times more than our polyurethane solution. In addition, concrete levelling using polyurethane is the preferred method of fixing and improving highways in the United States. Traditional mudjacking is a temporary fix due to the nature of the compound. Because polyurethane is weather resistant and will not expand or contract over time as concrete does, reapplication is not an issue. The only thing known to breakdown polyurethane is heavy exposure to ultraviolet rays from the sun. As we inject the polyurethane beneath the surface of the concrete, sun exposure is rare and insignificant. Concrete Experts is an established company that specializes in concrete levelling and lifting. We have served Calgary and the surrounding areas since 2012 with outstanding customer service and our business continues to grow. We believe in providing the highest quality of products and services to our clients in a timely manner. We have established ourselves as leaders in the industry of concrete levelling and lifting with a gold standard for service and results. Give us a call for a free estimate and discover the benefits of polyurethane and concrete levelling, lifting and raising. Our experienced and certified staff can provide you with the services you need and peace of mind in a job well done. We also recommend and may provide further services that may be required such as concrete replacement or custom concrete work.